To illustrate the economic value of volunteering in more concrete terms, let us quantify the sum for Canada. In 2010, more than 13.3 million people completed volunteer work. Counting up the hours rendered, these Canadians devoted 2.1 billion hours to their activities. This time served is equivalent to 1.1 million full-time jobs, or 8% of full-time jobs in Canada. The average hourly wage rate for 2012 is $24. This figure lines up with the Independent Sector’s approximation of the hourly value that volunteers provide. It is used by charities and non-profit organizations in communications about the importance of volunteering. Although individual volunteers may earn more during their regular jobs, they may not use these highly-paid skills in their volunteer activities. In turn, the average wage is a reasonable benchmark to use for our exercise. Based on the hours volunteered and an imputed average hourly wage, the economic value of volunteering in Canada is in the ballpark of an astounding $50 billion each year. This figure, though undoubtedly impressive, is likely a conservative estimate that does not include any capital investment, nor improved skills and attitudes. Put simply, $50 billion represents a lot of value. It is too large to simply dismiss. It is equal to about half of Statistics Canada’s estimation of the value add of the non-profit sector in Canada. As a share of the national economy, this figure represents slightly less than 3%. The economic value of volunteering is approximately the same size of the entire Manitoba economy. If the value of volunteer work were a company, it would be in the league of the largest firms in Canada listed in the S&P/TSX Composite Index – on the basis of market capitalization – sandwiched between corporate giants like Suncor Energy and the Canadian National Railway. Niagara Region Seniors Services reports annually on volunteer activities in Regional seniors’ programs and services. The value of volunteers’ contributions extends beyond the number of hours and dollars, as they provide an invaluable contribution to the quality of life of residents and clients. 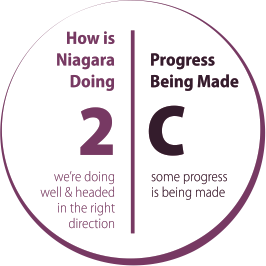 Source: Niagara Region. Public Health and Social Services Committee Minutes.